I wrestle with feelings of insecurity when it comes to homeschooling our boys. Good Lord, help my children! OK. I am not the most literate adult I know. In fact I did not read one book in high school. I was that student that could scan and skim, gather the right information and quotes to get an “A” in the class while never really having to read anything. I was pleasantly surprised by the plot of this tiny little book my son was reading, yet it made me question my ability to lead him. 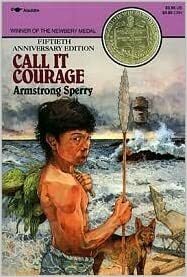 How could I possibly teach this child when I couldn’t even scan a book in advance to know it was about an island culture and their worship of courage? How could I look myself in the mirror and be confident in my ability to help my son love learning? After about three days of feeling bad, I realized my son’s interest had awakened as he read about and drew the setting of the story: an island surrounded by a beautiful coral reef. I picked up a Coral Reef book filled with fantastic photographs and we began exploring the complexity and delicacy of these living structures. Oh my, we were and continue to be captivated! A quick internet search, led us to one of my favorite YouTube Channels “Smarter Every Day” and viola, there was the beautiful, powerful, and astounding mantis shrimp. This one is worth watching with your kids! So there you go. A ride on my homeschooling merry go round. First I allow my son to read a book that I know nothing about. second, I form an opinion about the book strictly by its title. Then, I am struck “dumb” as I read to catchup with my son. next I see an opportunity to follow a rabbit trail down an area of interest. Then, we become engrossed and amazed in a little creature we didn’t even know existed. Yep, a successful homeschooling week I’d say. Of course, I failed again when I fell for the “Finding Nemo is all about a coral reef”: hook, line and sinker. 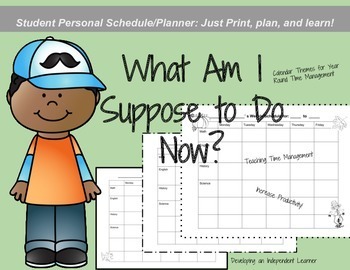 Do you ever struggle with feeling like you fall short as a homeschooler? If I could rewind the tape and begin homeschooling my kids today with the benefit of my 18 years of experience, what would I do differently? 1. I would spend the first 6-12 months to a year organizing my home, working on establishing a daily rhythm, and study my children. 2. I’d go to the library at least once a week allowing them to choose books that interest them, and hand picking random books for me to read aloud. I would be watching for what they are interested in, what makes them excited, what they find boring, etc. 3. I would rely on my husband more in creating a vision for our children, rather than trying to figure out what everyone else is doing. I wouldn’t waste a second trying to make what works for your kids work for mine. I’d keep my husband in the loop about our daily escapades and accept his advice more quickly. I mistakenly thought that because he worked outside the home all day he would be unable to see what the kids needed. This piece of humble pie would have been better to consume early in homeschooling. Put the highest priority on sharing our love for Jesus with our children. To insure the kids know their math facts inside and out. Period. Forget learning them, they need to over learn them. To inspire a love for literature by exposing the kids to a steady flow of great books. (I would read aloud daily no matter what their ages). I’d be picking the brains of the veteran homeschoolers, librarians, and authors that are in my sphere of influence for suggestions and I would prioritize a daily reading habit. I would focus all learning to develop excellent written and oral communication skills. I would find my children pen pals so they could perfect the friendly letter. I would have them do copy work from the masters and discuss why the sentences, paragraphs, essays, or stories are so great. I would understand that excellence in writing really comes from being well read and practice, tactics, practice. 5. I would find opportunities for my kids to stand and share in front of others, whether it is during a family BBQ or performing with the local theater- giving them the skill and confidence to speak in front of others. 6. I would view curriculum, tests, quizzes, and state tests as resources to help me customize each of the kids education, not the substance of their learning. 7. I would relax more. I’d let the kids get dirtier. We would play in the rain, build in the snow, chase rainbows, cloud watch, visit the farm, play at the beach, collect more leaves, examine more bugs, watch more plays, attend the theater, interview our doctors and dentists, locate inspirational guests like missionaries, mechanical engineers, artists, poets, and ace mechanics to share their passions with the kids. I would put a map of the US and the world under glass or plastic across my kitchen table and every single time we read or heard about a place we would locate it on the map and discuss how close/far it is from us. 9. I would do it all over again. And again. And again. 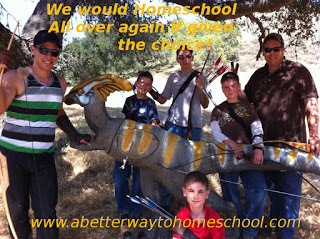 I know my children so much more intimately because of homeschooling. I am forever grateful for the vision my husband was given for our family. 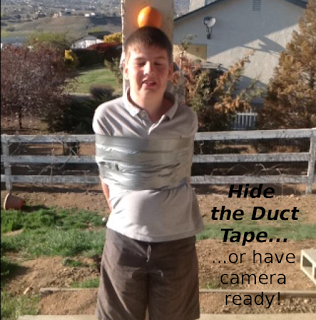 What are the top few things you would change if you could rewind the tape and homeschool those beginning years with the wisdom you have today? I have a love/hate relationship with the New Year. Every year I fall in love with Christmas break. Christmas. Lights. Lots of coffee and cocoa. Celebrating Jesus. Family. Ahhh… heaven. Then comes the longest day of the year for me. New Year’s Eve. I am not a late night owl. (Yes, I said late nights were on my love list just a few sentences ago, but I meant late like ten o’clock). My kids seem to think that it is awesome to stay up until midnight to ring in the New Year. Me? Not so much. I hate New Year’s Day because it reminds me that Christmas break is over and that I have not thought about school for a few weeks. Drat. Well, we are now three days into this year and I am less prepared than ever. Each morning I am scrambling to make a to do list for each of the boys. As I remind myself of my priorities, I thought I would share them with whoever may be in the same boat with me. If you are brand new to homeschooling, you may find comfort in knowing that even us seasoned homeschoolers short circuit at times! My attitude sets the tone for the entire home: Make time to spend with the Lord each morning. My relationship with my husband trumps every other relationship: Focus on blessing, encouraging and loving my man. My kid’s character is waaaay more important than curriculum: focus on diligence, discipline, integrity, kindness, and love. Relax. The best lessons in homeschool are found off the beaten path. Loosen up on the to do list and keep my eyes open for opportunities! Look ahead. I have one child graduating High school and another entering high school this year. I need to wrap my head around that. Make time (and a cup of coffee). Focus on the eternal. Yes, I am a Christian. I believe the Lord is coming back, just like He said He would. The daily news could have been taken right out of Old Testament Prophecy. I need to share my faith with urgency-especially with my kids! Take care of me. I am usually the last person on the list of people to help. I need to make sure I do not forget me. I tend to forget to eat and drink water. I need to lace up my shoes and get outside. I need to lose a few pounds. What would you remind yourself? We learned about phonics and I quickly memorized the phonics circle. We listened to Ferdinand the Bull. I laughed and laughed when he “sat on a bumblebee”. I played house during play station time and practiced “ironing”. At snack time, my friend Shelley and I turned our milk cartons into little boxes so we could collect things during recess. Shelley and I played tag during recess until we couldn’t run anymore, then we plopped down in the clover patch to search for four leaf clovers. After recess, Mrs. House quizzed us on “F, F, for Freddy Fox” and sang “This Land is my Land” with the first grade class next door. We covered a paper with all different colors of crayons and then scribbled all over that paper with black crayon as hard as we could. Once is was black, we used a paper clip to scratch designs into our picture. I was so excited, I made two! We worked on counting and did some fun worksheets. I couldn’t believe it was time to go home again! My friend has a kindergartner who has a reading quota and is already placed in a remedial group because he does not read fast enough. Her class has to skip recess often in order to get more work done. She also has homework. At five years old. Excitement for learning is perishable. If we turn our culture’s creative, daydreaming, dancing five year olds into frustrated, militant, quiet little soldiers who can sit at a desk for 5-6 hours a day, should we be surprised that obesity, depression, and anxiety will dominate their lives as teens and adults? We need to allow children to return to childhood and delight in life again. Let them pick clover, turn milk boxes inside out, spill glitter while making a picture for dad, play hopscotch, swing and swing, play hide and seek, share, sing, dance, and play. Kids learn through play and role playing. This is how children grow up to be creative, self-expressive, caring adults. 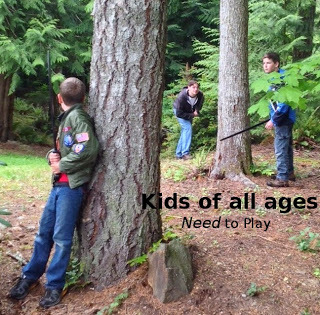 Kids need to be outside, sometimes guided, sometimes just supervised so they don’t kill themselves. But they need to be outside. Rain or shine. Snow or wind. Kids need to color, cut, sing, dance, role play, rest, be read and read to, count by bouncing balls and keeping score, and laugh. Learning is much easier when the child’s basic needs are met. Parents, we need to do something for the sake of our children and our future society. This is personal. For my family, it is personal enough to pull my kids from the mainstream to school them at home. Where they run. Where they laugh. Where they read when they are developmentally ready. Where they play outside. Where they explore and experiment. Today, in an hour and a half I am kicking my four youngest sons outside with play swords. 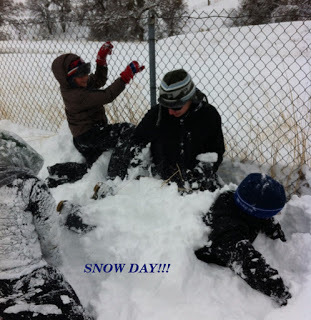 They will play outside for an hour during the time of day that most American Kids will be scribbling on their desks and suffer from numb tushes. Yes, even the 16 year old. They are all smart, excellent students. Some are learning at a slower pace than their peers, but all are delighted to learn, read, discover and play. Ask yourself if your young children are delighting in life. I’m not asking if they are busy, can win spelling bees, read at the age of three and solve algebraic algorithms by 6…but do they delight in life? Do they enjoy their classrooms/learning environments? Are they nurtured by their educators? Do they laugh and run and sing and dance? Do they build, explore, and experiment? I am concerned about today’s kindergartners. We need to stand up and stop accepting new “cultural norms” as normal and ok. They are not. Our kids, as a nation, are suffering. Find a handful of children who are delighting in life, are full of excitement, and are excited to learn. This might be a challenge, but you will see a few. Then start talking to their parents and glean wisdom. The governing establishments do not have the answers. Am I a Good Enough Homeschool Teacher? Sometimes I wonder if I am the best teacher for my children… Am I alone?